Rabbit anti human RPL10 antibody recognizes 60S ribosomal protein L10, also known as Wilms tumor-related protein, laminin receptor homolog or tumor suppressor QM. This antibody has been extensively validated for western blotting using whole cell lysates. Rabbit anti Human RPL10 antibody recognizes RPL10, also known as 60S ribosomal protein L10, Wilms tumor-related protein, laminin receptor homolog and tumor suppressor QM. Ribosomes, the organelles that catalyze protein synthesis, consist of a small 40S subunit and a large 60S subunit. Together these subunits are composed of four RNA species and approximately 80 structurally distinct proteins. The RPL10 gene encodes a ribosomal protein that is a component of the 60S subunit. The protein belongs to the L10E family of ribosomal proteins. It is located in the cytoplasm. In vitro studies have shown that the chicken protein can bind to c-Jun and can repress c-Jun-mediated transcriptional activation, but these activities have not been demonstrated in vivo. RPL10’s inclusion as a Wilms tumor suppressor gene, and its function as a 'laminin receptor homolog' are now believed to be misnomers. Alternative splicing results in multiple transcript variants. RPL10 also uses multiple polyA signals, with the 3'-most polyA signal overlapping the deoxyribonuclease I-like 1 gene on the opposite strand. RPL10 is co-transcribed with the small nucleolar RNA gene U70, which is located in its fifth intron. As is typical for genes encoding ribosomal proteins, there are multiple processed pseudogenes of RPL10 dispersed through the genome (provided by RefSeq, Feb 2012). 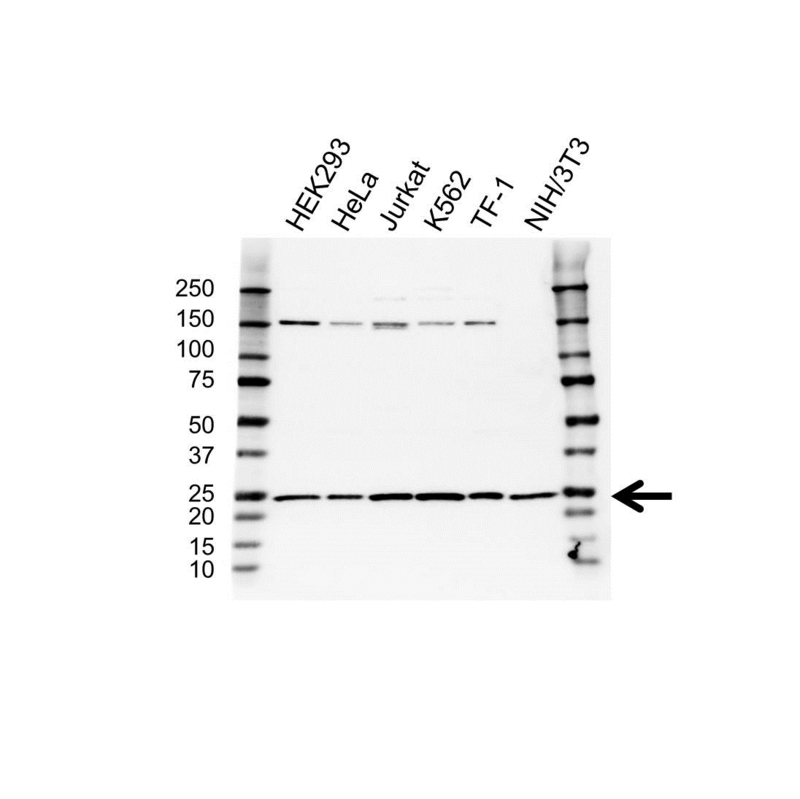 Rabbit anti Human RPL10 antibody detects a band of 25 kDa. The antibody has been extensively validated for western blotting using whole cell lysates.